Tap 2 Drain Are Repair Experts! In Mission, Langley, Maple Ridge, Abbotsford, and Chilliwack Tap 2 Drain will always present the best option to repair your plumbing problems. We never tell you what to do, we always present your options for you to make an informed decision. The big question is always, is it worth it? That’s where our Nice Guy Tech’s years of experience will help! Repairs are also easily tackled when you have the right parts on hand, Tap 2 Drain stocks our vehicle with enough parts to solve 99% of plumbing repairs. No having to pay extra time for your plumber to run out to get parts. What kind of things can a Nice Guy Super Tech repair? Almost any plumbing related problem you can think of: Leaks, Drips, Smells, Clogs and Renos just to name a few. The easiest way to prevent having to repair your plumbing system is preventative maintenance. No one likes having inconvenient repairs arise and Tap 2 Drain has a solution. 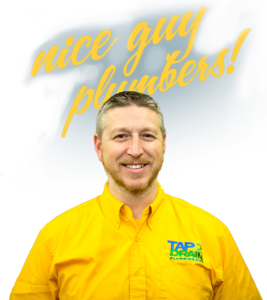 As a member of our Tap 2 Drain Club we send a Nice Guy Tech once a year to your home to inspect your plumbing system. A whopping 323 points to be exact! You are presented with a detailed report of items that require attention immediately, soon or in the future as well as items you can tackle yourself. By taking care of any problems before they arise and maintaining your plumbing you can prevent 99% of emergency calls. Saving you big time dough, we are all about saving time, money and STRESS! Maintaining your plumbing and heating systems isn’t normally top of anyone’s mind. But just like any mechanical system wear and tear and part failures are not uncommon. When you properly maintain a system there is less of a change of catastrophic break down. Furnaces stop pumping warm air right in the middle of a snow storm, sewers back up in the middle of the night or hot water tanks flood the basement while your on holidays. While not all failures are 100% preventable, by properly maintaining your homes plumbing and heating systems you can avoid these types of painful situations. Tap 2 Drain is here to help! Either new construction or new to you, it is always a good idea to have one of our Nice Guy Tech’s inspect your homes plumbing. He will also show you important things you need to know about your home. Like where your water and gas shut off are and how to use them. How to shut off water and gas to your hot water tank and how to use the individual shut offs in your home. Be prepared and get to you know your home. During the inspection we always note down important items like age an type of hot water tank. That way in an emergency situation we already have the information we need to get parts ASAP. We got your back 24/7!